The Russian government next year will slash the number of subsidized air routes between the country’s regions to 108 from the current 124, the Federal Air Transport Agency has reported. There will be fewer subsidized city pairs originating or ending in Yakutsk, Irkutsk, and St. Petersburg; on the other hand, several new routes from Tyumen, Rostov, Kaliningrad, Gelendzhik, Anapa, and Bugulma will be state-funded. Major city pairs such as Novosibirsk-Omsk, Samara-Yekaterinburg, and Volgograd-Kazan will receive no more government support. At the same time, the following new routes will emerge linking, in various combinations, Rostov, Volgograd, Yekaterinburg, Kazan, Samara, and Krasnodar. The number of airlines eligible for state grants in support of socially significant but underfinanced routes has also been cut. The new list is made up of 18 airlines (against the current 23): Grozny Avia, Pskovavia, UVT-Aero, Angara, RusLine, NordStar, Komiaviatrans, Orenburzhye, Aeroservice, Turukhan, Yakutiya, Alrosa, KrasAvia, Siberian General Aviation, Kostroma Aviation Enterprise, Aurora, Red Wings, and UTair Aviation (the latter two did not enjoy the privilege in 2015). In September, the RIA Novosti news agency cited Deputy Transport Minister Valeriy Okulov as saying that the government had decided to preserve all the current air transport subsidies (namely the interregional program, the one for Crimea, the Kaliningrad and Far East ones, and the program for air services within the Volga Federal District) at the 2014 levels. About 9 billion rubles ($139 million at the current exchange rate) will be reserved in the 2016 federal budget for all of these subsidies, Transport Minister Maxim Sokolov told Rossiyskaya Gazeta daily in October. 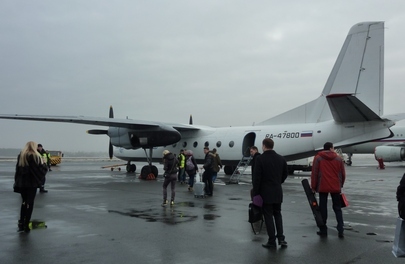 The government had reserved 4.23 billion rubles in subsidies for interregional air services for 2015, of which sum around 3 billion rubles had been spent by the end of September.